The Florissant Formation is located in the geographical center of Colorado, 36 miles west of Colorado Springs at an altitude of 8,500 feet. The Clare Quarry is located .25 miles south of Florissant on the Teller County Road One. This quarry contains abundant plant remains and remarkable insect fauna. Also fishes, and birds have been found at this location. Hundreds of species of known and unknown varieties of plants are commonly found. Some of the specific types include pine, cedar, hickory, sumac, willow and poplar. Insects include many different species of ants, spiders, and flies. Fossils hold the secrets of our lost past. 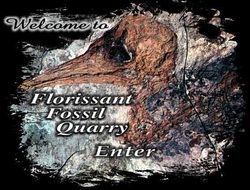 Witness the pages of our distant history through the rare and wonderful experience of collecting Florissant Fossils. The Florissant, Colorado area was once a lake surrounded by woody vines, shrubs and trees. Many of the trees were giant Sequoia similar to California redwoods. Because it was warm temperate region, the area was rich with vegetation. Explosive eruptions by volcanoes repeatedly showered volcanic dust and pumice on the lake. Our summer hours are 10-5 daily and by appointment. On sight collecting, groups, schools and individuals. We also supply museums, schools, gift shops, and collectors.